The Avid Reader Book Club meeting for the month of October 2015 will be on October 26th. This month's selection is Miss Peregrine's home for peculiar children by Ransom Riggs. The Avid Reader Book Club meets every fourth Monday at 7:30 p.m. in The Avid Reader to discuss a new book selection. There is no fee to join and no list to sign up. Starting May 2015, The Avid Reader Book Club selections and meetings are be posted here on AvidReaderBooks.com, as well as on our Facebook and Twitter accounts, and are included on our Pinterest "Avid Reader Book Club" board. You will also see announcements about the selections via our Mailing List. You can also go to the Davis Wiki for additional information and updates. This month’s selection is Miss Peregrine’s Home for Peculiar Children by Ransom Riggs. Join BookEnds BookGroup This month we will be discussing Miss Peregrine's home for peculiar children by Ransom Riggs BookEnds BookGroup usually meets every last Sunday of the month at 2 pm in The Gallery. BookGroup reads are 20% off prior to the event to BookGroup participants. Free and all are welcome. Mysterious Galaxy San Diego's in-store event on Friday with Ransom is canceled, due to unforeseen circumstances. Please watch our calendar for other opportunities to meet Ransom, including the Los Angeles Times Festival of Books. Writer and filmmaker Ransom Riggs returns to the Galaxy for the paperback release of Hollow City, sequel to the international best-selling novel of vintage photographs and prose. In 2015, Twentieth Century Fox and director Tim Burton will bring Miss Peregrine to the big screen. Hollow City: The Second Novel of Miss Peregrine’s Peculiar Children, contains a special Q&A with Ransom, never before seen photos, and an excerpt from the forthcoming third novel in the series. Ransom Riggs signs Hollow City in San Diego. The Never Too Old YA Book Club meets at 8 p.m. to discuss Miss Peregrine's Home for Peculiar Children by Ransom Riggs. Ransom Riggs's book Hollow City: The Second Novel of Miss Peregrine’s Peculiar Children was available from LibraryThing Early Reviewers. Ransom Riggs's book Miss Peregrine’s Home for Peculiar Children was available from LibraryThing Early Reviewers. 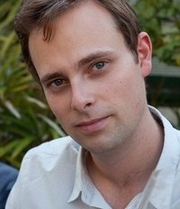 Ransom Riggs is currently considered a "single author." If one or more works are by a distinct, homonymous authors, go ahead and split the author. Ransom Riggs is composed of 3 names. You can examine and separate out names.